It’s all about the Shedquarters. 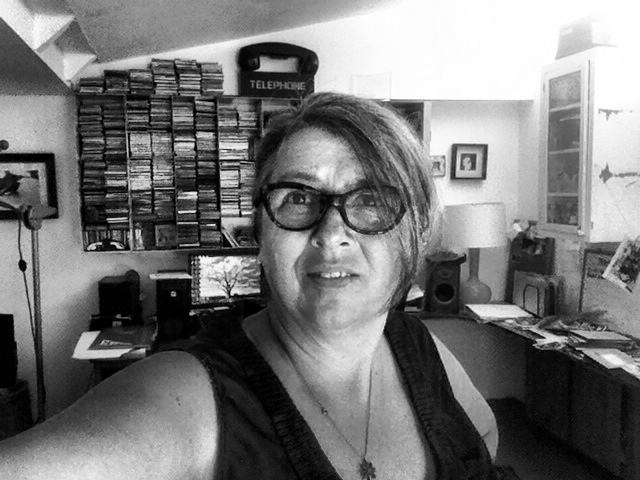 This week it’s come to light that a lot of friends are posting articles to my facebook feed extolling the virtues of Shedquarters for the home based business. Apparently I’m ahead of this trend, since I moved into my own converted garden shed over a year ago. 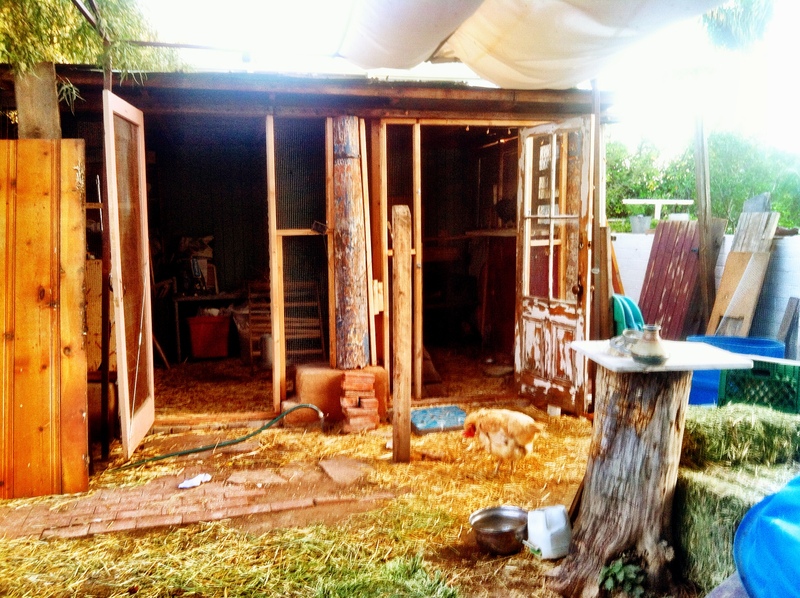 With the sudden popularity and interest in shedquarters, it’s probably worth sharing exactly what it’s like to work out of one, just in case you’re at all curious as to how it is to set up shop in your own little cluster at the end of the garden. I will state the obvious first. It’s certainly not for everyone. If you’re not an ‘isolationist’, or in other words, you want to be around people on a daily basis (other than your family or your dog, cat or chickens), or you need the structure and organization that going to work in a more formal office environment brings, then Shedquartering is probably not for you. Also, garden sheds can feel sometimes like camping. I have a family of long legged spiders that have taken over and some months I find babies hatching by the hundreds – I vacuum and sweep, and no matter how much time I spend removing them, they come back. So if you have a fear of spiders or bugs or lizards…that too might be a consideration. However, if you like a solitary work environment where you can focus and not be distracted (other than by your own misleadings to social media or moments taken to chat with the chickens or water the garden) , hours will pass without interruption and if you can picture your meeting room as a table and chairs scattered under a shade tree, then this rent free office life might just be ideal. Who knew paradise was an official tax deductible item, and it’s yours – rent free! I work with creative clients, so they seem to love to visit this Shedquarters. If your clients need to have confidence in you because you have a more formal office – then perhaps this type of situation might not fit the bill, although I am sure they will almost always approve of your ‘can do’ attitude. Meetings here are almost a ritual of sorts, with tea bought out on a tray for my guests. For me, it’s a pretty special place to come to work each day and conceptualize, create, talk though ideas and process things. It’s also a place where I can escape the gaggle of best friend teens that come and visit my 13 year old son (although now I think about it, they somehow always end up coming and visiting me and hang out to talk). My son loves to come and do his homework in here, so it has extra value! And finally, when my partner and I just want to catch up in the quiet, we sneak out here and sit back and enjoy the quiet. My Shedquarters lays hidden below the weeping Sumac trees that surround the back wall of our yard. 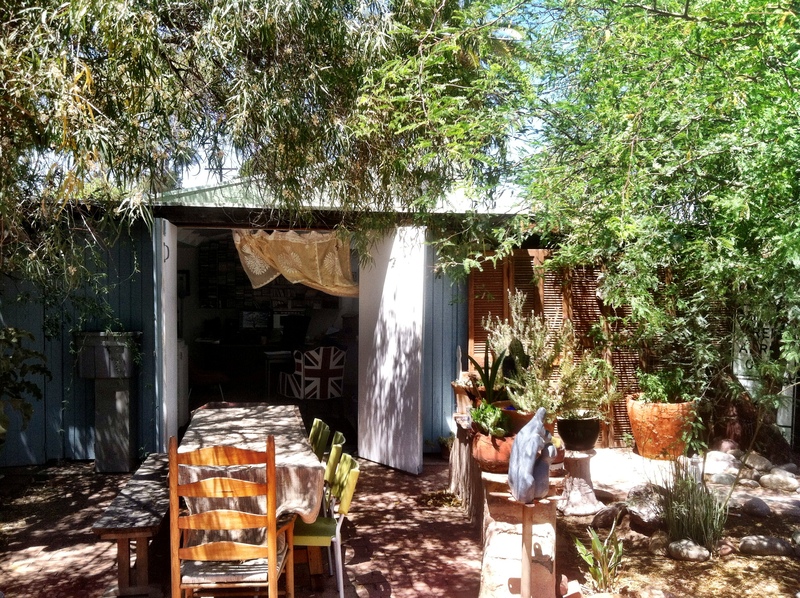 The structure was once a ramada with no walls for many years, then a potter owned our 1947 ranch house, which is located in a pretty and green neighborhood in mid-town Tucson. He turned it into a studio, with north facing high windows to allow good light, insulation to keep out the heat, and electricity. It’s around 18 ft x 14ft in size, with a sloping ceiling making it feel larger than it is. Sometimes I wish it were a little roomier, but it keeps me moving out unnecessary and finished projects and it demands I stay on top of keeping it organized. I spend hours at my computer hidden behind potted lavendar and sage, working on designs, organizing events and campaigns, and putting projects together. I’ve realized my work days often involve staring only at a small area of my paradigm – my computer or an area within 10ft of it. Here I can travel quickly around the world, and have virtual meetings, create concepts and communicate. I really could be anywhere in the world. Big city or small town. A friend gave me a wall air conditioner unit he no longer used to keep the space cold through summer months. The rest of the time, I open up the double barn doors onto the yard and enjoy nature. In winter, when it gets cold and frosty, I switch to an oil radiator that does the trick. In Spring and Fall I pull the linen curtain to stop the flying residents of my garden coming in. My dog tells me each morning when it’s time to go to work…he runs enthusiastically ahead of me, urging me to get to work, he acts as my cheering co-hort, and leads the way. The commute is divine. Its 20 steps at the most from my living room, and I check on my hens along the way. Among the cluttered tabletops and desk inside, I’ve installed storage and worktops to hold my paints, office supplies, photography equipment and music, as well as my xerox pro workstation – an over sized printer, a remnant from another time in my business life, that I love. I have all my worldly needs to do the work, and the space, the peace and the time. While I dream of updating it to a Pinterest version of itself, this current version works just fine. It’s a productive zone, one where I can pick and choose projects. Not having the overhead of renting an outside office has left me free of heavier financial pressure. I feel more able to pick the projects I want to do and also more time to do more creative work of my own. It’s the reclusive self that emerges here, gathering creative ideas, stumbling around sometimes, because this creative process is also revealing of ones self doubt and need to focus to accomplish. You definitely have to have the practice of discipline to do this. I try to maintain a strict schedule, but under the this freedom to work at anytime of day or night, I arrive at my desk after tending to home chores like laundry, cleaning up breakfast, the house and walking the dog. I am fully immersed by mid morning- I tune into KCRW so I feel as though Los Angeles is just a fingertip away, or WNYC, or the local NPR station. 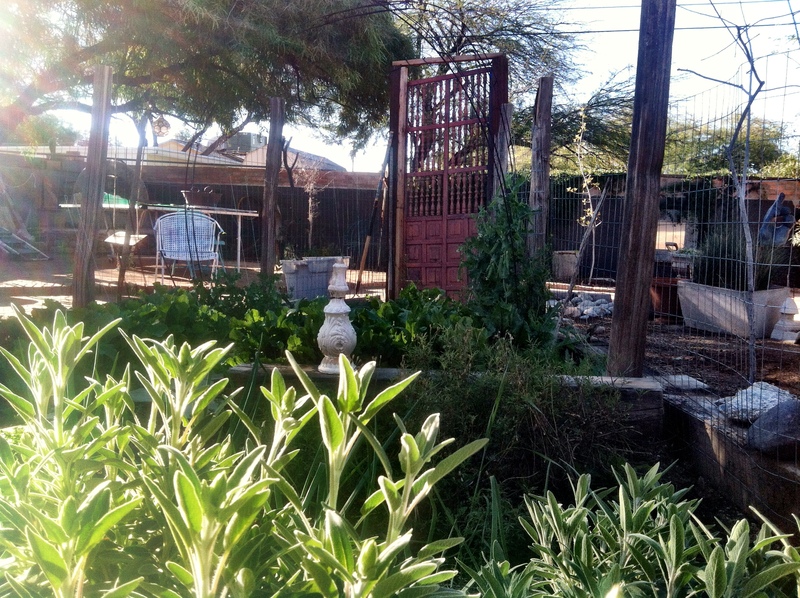 The garden, like the work that comes out of the shed, flourishes under my distracted attention of being Shedquartered. I am distracted by flowering poppies, the rows of kale with bright yellow and red stalks, the swallowtails that metamorphosis among the flowering dill plants. The start of the season of tomatoes and basil and knee high native corn growing in my patch. Our backyard is no longer a simple urban yard but a small urban mini farm and is bursting with life since I relocated. Our vegetable plot exploded with a burst of green and color over the early spring. Onions, parsley, dill, lettuce, kale, carrots, peas, sage, beets, poppies – we are literally full on the goodness that emerges from this patch that feels like an island of soothing emerald green in an otherwise sun-baked land. I am faced with the usual rhythms of self employment, and I share my office common areas with my animals rather than people. My adjoining neighbor is my chicken coop and run where 8 hens are laying. I can’t help but feel so fortunate to have come to this place after so many years of renting office spaces and commuting in traffic jams and freeways, running businesses, being tied to buildings that cost a fortune and felt like shackles. It feels as though I have finally allowed myself to truly experience a working space that in essence has a freedom I’ve not had before. 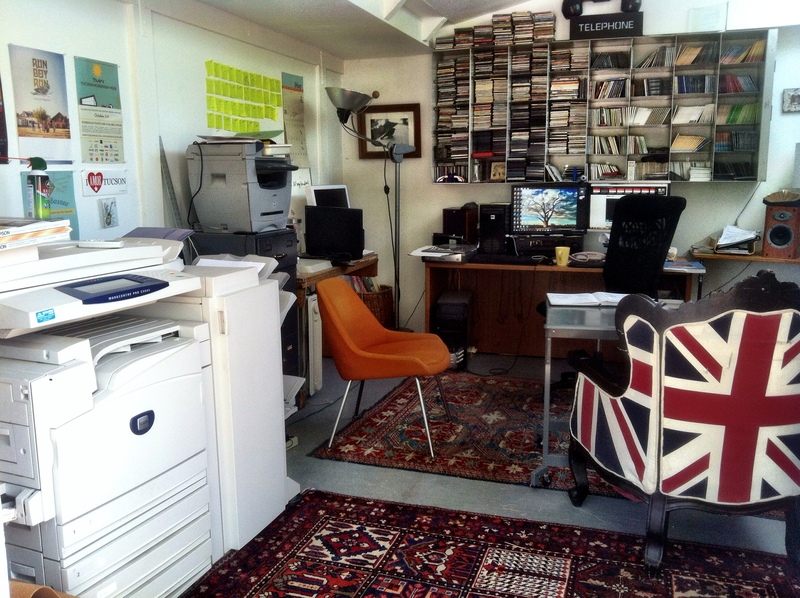 So before you go looking for a new office, just consider the advantages of Shedquartering. All of the benefits without the overhead, and still a separate structure from the house. In my world right now, it is reaping it’s rewards. I can’t say it’s forever but for right now, it’s given me room to breathe with fresh air included, work and enjoy. For now, my wee little shed is where my head and heart can expand and create what was impossible before. It really could be anywhere. hi-ho its off to work I go. meanwhile, adjoined to the office is the micro-urban-mini farm – my little paradise.